Plans to demolish a Burgess Hill warehouse and replace it with a block of ten flats have been approved. 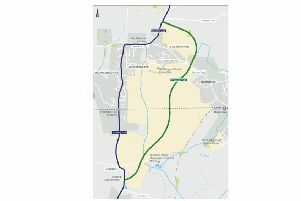 The application, for the Expresslube (UK) Ltd site, in Victoria Road, received unanimous support from Mid Sussex District Council’s planning committee on Thursday (August 30). The 3.5-storey development will include an undercroft for 13 cars. While this falls slightly short of the number called for in the Burgess Hill Neighbourhood Plan, the meeting was told that planning officers did not think there would be a problem. When it came to the look of the building, Pru Moore (Con, Burgess Hill – Leylands) mentioned that a development further up the road was known locally as ‘Cell Block H’ because of the way it looked. She asked planning officers for a clear picture showing the design of the front of the new flats, as the one shown to members was ‘not very well defined’. The council received one objection to the plan, from the joint-owners of a neighbouring business, which raised concerns about noise, the impact the development would have on the structure of their building, residents being able to look into their meeting room and the potential loss of a private right of way on the land. The money has been earmarked for projects including: upgrading the changing facilities at Fairfield Recreation Ground, improving the play equipment in Woodpecker Crescent and improving the 5th Burgess Hill Scout hut.